Available on Amazon and Etsy. Blue ribbon winner at the Marin County Fair 2016 for illustrated creative writing! Ranger and KowGirl are Australian cattle dogs who meet in Sausalito, California on their morning walks, fall in love, get married, and set off for a honeymoon in Paris (honeymoon adventures in the next book). 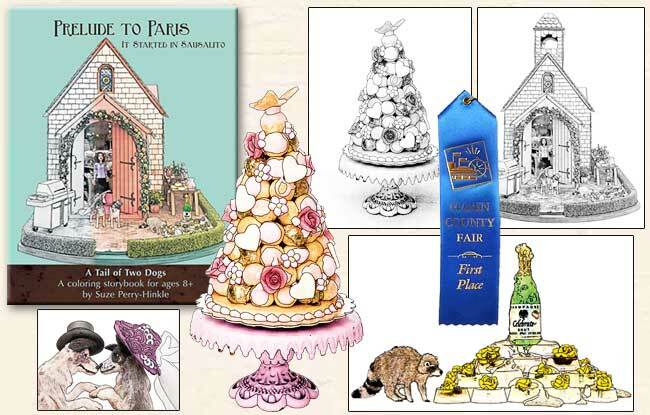 Perfect for miniature-fanciers, dollhouse enthusiasts, dog-lovers, and artists both young and young-at-heart, these "coloring storybooks" have the detailed sketches that advanced colorers are looking for, plus a story that engages the child in all of us. It is unique in that almost all the sketches have been created from actual miniature scenes, painstakingly created in 3D and then photographed to illustrate the story. There are two editions of this book. Both have black and white sketches to color, but the Collectors' Color edition also has colored sketches alongside. Let these inspire your creativity, or just enjoy the story and appreciate the beautiful detail work in the miniatures.